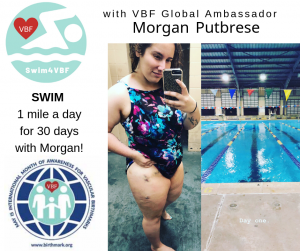 These are some of the many ways our VBF Family is coming together to raise awareness around the world for our VBF Awareness Movement this year. How will you raise awareness this year? Over 1,050 people have signed the VBF Anti-Bullying Pledge. Take 1 minute to stand with us against bullying. Sign the pledge today. Amanda Leger wins Buddy Booby’s Birthmark FREE book give away and sends adorable photo of a Read Along with her daughter and husband. 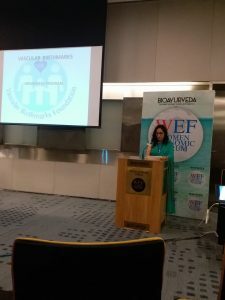 Maria Torres- Salo creates Facebook Fundraiser for VBF’s Month of Awareness. 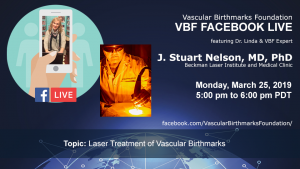 Linda hosts a Facebook Live session with VBF Expert Dr. Stuart Nelson on the topic of To Treat or Not to Treat on May 21, 2018. Laura and Devin Fischer host classroom awareness event at St. Paul’s Early Childhood Development Center in Orange, CA to honor their son Caleb with a Buddy Booby’s Birthmark read along, goodie bags with informational materials, and bracelets for all the children. 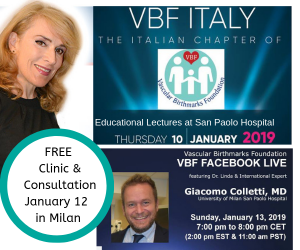 Dr. Linda hosts a Facebook Live session with VBF Expert Dr. Stuart Nelson on the topic of To Treat or Not to Treat on January 11, 2018. Ben and Alison Maddox created and shared a Give2myVBF page for their son Carson to celebrate his 6th birthday. Kelly & Trent Bossley celebrate Day of Awareness by reading “Buddy Booby’s Birthmark” and handing out VBF stickers to their son Nolan and daughter Lydia’s preschool class in honor of Lydia who has a PWS. Kelly Bossley shares a Buddy Booby’s Birthmark Read-Along photo at her daughter’s preschool. 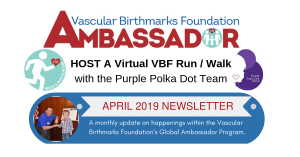 Michelle Lukaschewski with the Purple Polka Dot Team registers #TeamVBF for the Colfax Marathon in Denver, Colorado on May 19-20, 2018. 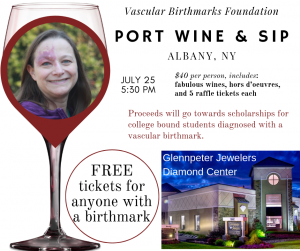 VBF Board member Sharon Israel hosts Park Lane Jewelry fundraiser for VBF’s Month of Awareness in honor of her daughter Olivia who VBF helped network into treatment. 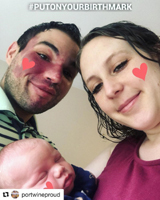 Eric Pixley spills his heart out in viral facebook video thanking his parents for supporing his journey living with a port wine stain birthmark. VBF’s Global Ambassador, Eric Pixley, raps about his birthmark, encouraging others to #PutOnYourBirthmark on May 15 for VBF’s Day of Awareness. 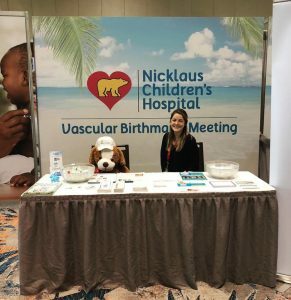 VBF Physician Expert Dr. Ana Duarte and her team lead 200 people to Rock the Hearts at the Children’s Skin Center at the Nicklaus Children’s Hospital. 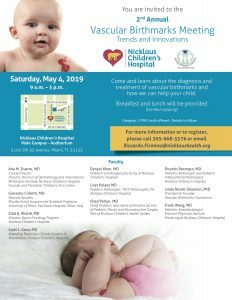 Dr. Linda hosts a Facebook Live session with VBF Expert Dr. Ana Duarte on the topic of Treating PWS and Hemangiomas in Infancy with Laser and Drug Therapies on May 4, 2018. VBF Board Member Sarah Kenis asks for donations to VBF through Sarah’s Facebook Fundraiser for VBF. 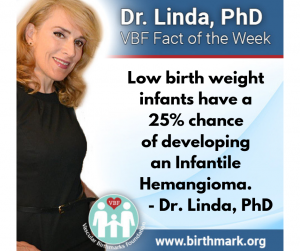 Dr. Linda represents VBF at the Vascular Birthmarks Meeting: Trends & Innovations – at Nicklaus Children’s Hospital in Miami, Florida. 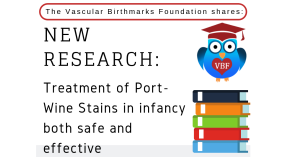 Dr. Ana Duarte shares Dr. Duarte’s Vascular Birthmark Tip of the Week on why early intervention is key. The Sheehan Family is hosting a Bravelets (Be Brave bracelets) online fundraiser in honor of their daughter Reagan. Purchase today and Bravelets will donate 25% to VBF in Reagan’s honor. Lauren Sheehan hosts a Facebook Fundraiser for VBF in honor of her daughter Reagan. Renee Andre Walters hosts Birthday Facebook Fundraiser for VBF. 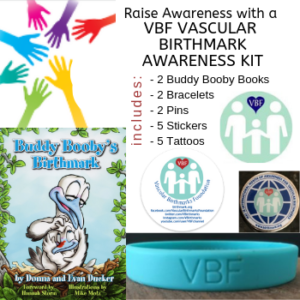 VBF Board Member Jeff Bergen partners with teachers in Maine to sponsor a 1st grade classroom awareness campaign in honor of a little girl with KTS, donating informational materials, stickers, bracelets, and 80 Buddy Booby’s Birthmark books for each child in the class. 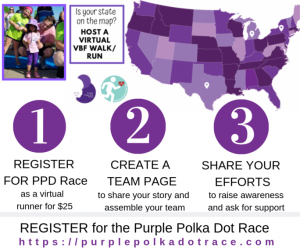 Jody Lee and the Purple Polka Dot Race Team SOLD OUT the AR Workshop, where three people shared their birthmark stories while their group of 40 worked on projects, all while raising $628 for VBF through the AR Workshop’s gift and a raffle. The Lee Family & Purple Polka Dot Team hosts 23 people at Yoga & Brunch on May 19 in Michigan and donates $761 to VBF’s mission. Aubrey Meister wins a FREE Buddy Booby Book on Facebook during our March Madness: Mad About Buddy Booby Campaign, and gets her state on the map. Crowned Mystic Mermaid of central New Jersey, Allison raises awareness for VBF through a Buddy Booby live read-along on Facebook. 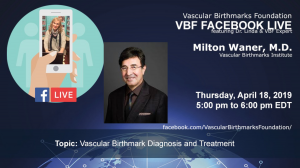 Dr. Linda hosts a Facebook Live session with VBF Expert Dr. Milton Waner on the topic Treating Hemangiomas and Vascular Malformations on February 27, 2018. 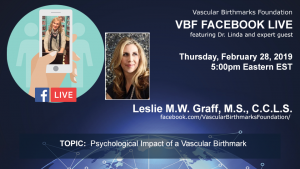 Dr. Linda hosts a Facebook Live session with VBF Psychosocial Expert: Leslie Graff on the topic Psychosocial impact of a vascular birthmark on January 25, 2018. 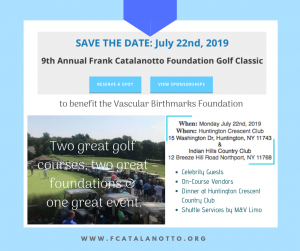 Save the date for the Catalanotto Foundation’s 8th Annual Golf Outing on August 6th 2018 at the Old Westbury Country Club. 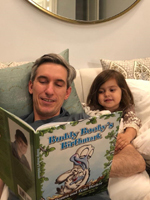 VBF Physician Expert Dr. Gregory Levitin shares adorable photo reading the Buddy Booby’s Birthmark Book to his daughter Cora. Linda’s Sponsor a Family Facebook Fundraiser reaches its goal of raising $1,500 to sponsor three families to attend the NYC Conference. 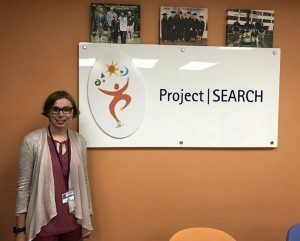 Mother and daughter team Cindy & Bailie Heston set to deliver informational materials to 18 local physicians, as they raise awareness in the Oklahoma area. 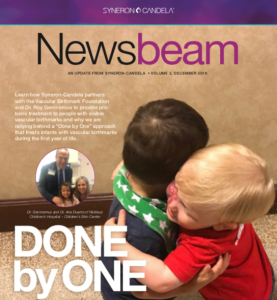 VBF Board Member Andria Gottsabend shares her family’s story through the Sisters with Birthmarks Give2MyVBF page to honor her two daughters, Olivia and Jessica, born 10 years apart, and both with beautiful birthmarks. Andria Gottasbend, VBF Board Member, created a Give2myVBF page to share. Mother & daughter team Carla Mannix and Jaysa ask for donations to VBF through Birthday Bracelets for Jaysa on Facebook, and their Birthday Bracelets for Jaysa Give2MyVBF Page. Ava shares the story of how she overcame her PHACE Syndrome diagnosis to become an accomplished varsity cross country athlete, scholar and advocate for those with vascular birthmarks through her Birthmarks are Beautiful Give2MyVBF Page to benefit VBF’s research mission. 2017 VBF Catalanotto Perseverance Scholarship Award Recipient Harrison Wile pays it forward with a college informational booth and bake sale fundraiser for VBF at Clemson University in South Carolina. Alice Cooper Rocks her Hemangioma, Let’s Roll in the Donations for Research and help her reach her 10,000 goal with her Give2MYVBF Page. Kelsey Quinn and her family rock their own custom designed VBF- Hope T-Shirts for our Day of Awareness. Valerie Boudreau asked for donations to VBF for her birthday through Valarie’s Facebook fundraiser for VBF. Dr. Linda, VBF Board Chair Sherry Parrish and the VBF on the Move Team meet with three birthmark families in Texas. Mother wins first-ever Buddy Booby March Madness Give Away on Facebook and gets Washington State on the map. Lenka Gotart shares photos for May 15 Day of Awareness. Assi Family shares their story and photos. Gabriella Castellanos continues the #Biking4Alonso tradition in honor of her son with a PWS with two ride-along events at spin studios on May 5 in Polanco and May 17 in Arcos Bosques, and a Give2MyVBF page so that people all over the world can ride along virtually. 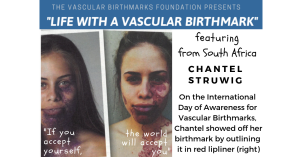 Gaby also hosts a Facebook Live make-up tutorial to promote #PutOnYourBirthmark day. Dawn McKay of the UK raises awareness with an informational event at her daughter’s school. Batool Kausha and Brig. R.K.Kaushal, a veteran from the Indian Army, distribute 100 VBF brochures and work with a panel of 12 doctors at a Vascular Birthmarks Awareness program in a medical camp in Bhopal city, capital of the state of Madhya Pradesh in Central India. Over 50 people share photos and stories of how VBF has helped them or a loved one. 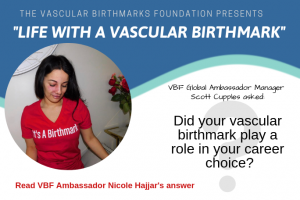 Thousands of people across the world join our #PutOnYourBirthmark campaign for the May 15 VBF Day of Awareness. 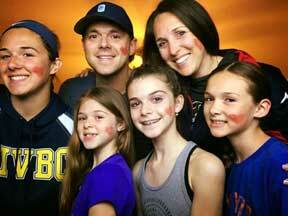 VBF Ambassador Eric Pixley and family join our #PutOnYourBirthmark challenge. Crystal Hodges posts 31 Drawings of Awareness on her Facebook pagefor kids who show their favorite cartoon or superhero with a port wine stain. Very cute! 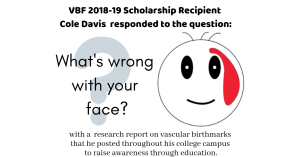 Ann Snipes asked for donations to VBF for her birthday through a Facebook Birthday Fundraiser for Vascular Birthmarks that runs through February. Sandra Analy asked for donations to VBF for her birthday through Sandra Analy’s Birthday Facebook Fundraiser for VBF. Ginny Ruger Paterno creates a Facebook fundraiser for VBF for her birthday. 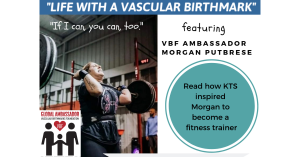 Erin Eskildsen launches a Birthday Fundraiser on Facebook for VBF. Heather Funk to host second Rock the Dots LuLaRoe Fundraiser for VBF, starting on the VBF Day of Awareness on May 15. 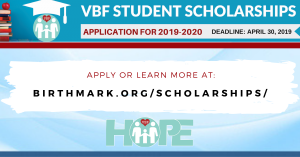 Amanda Leutenberg with EverGreyDesigns to host a t-shirt fundraiser for VBF of her custom designed Acceptance through Education VBF shirts for the VBF Month of Awareness in May. Nalini Shankar hosts Birthday Facebook Fundraiser for VBF. Dr. Linda to host AAP Webinar on Early Intervention in May. 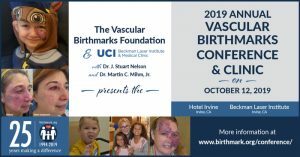 Dr. Linda partners with six VBF Expert Physicians to offer a half-day of free consultations as part of the VBF Vascular Birthmarks Month of Awareness in May. 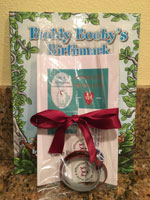 During our March Madness tournament, VBF shared Buddy Booby’s Birthmark, the story of VBF’s official mascot with a port wine stain, with families in the following states: AL, AZ, CO, DE, KY, MN, MO, NY, NK, PA, TN, TX, and WA, and even two countries: Canada and Australia! You can still get your state on the map today. 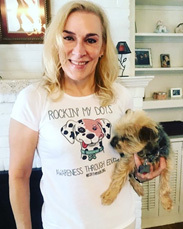 Dr. Linda & Moses Rockin’ the Dots in a custom Awareness Through Education T-Shirt. 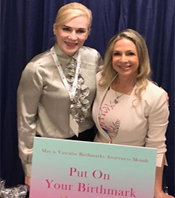 Dr. Linda and Dr. Ana Duarte at the Vascular Birthmarks Conference in Miami. The Catalanotto Family shares their #PutOnYourBirthmark photo. 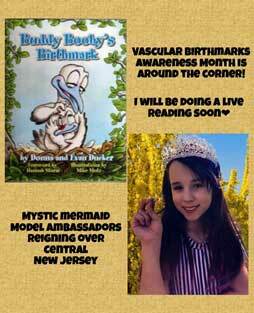 Mystic Mermaid of central New Jersey, Allison, raises awareness for VBF through a Buddy Booby live read-along on Facebook. 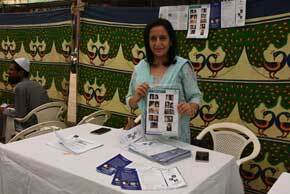 Batool Kausha raises awareness at a medical camp in Bhopal city, capital of the state of Madhya Pradesh in Central India. 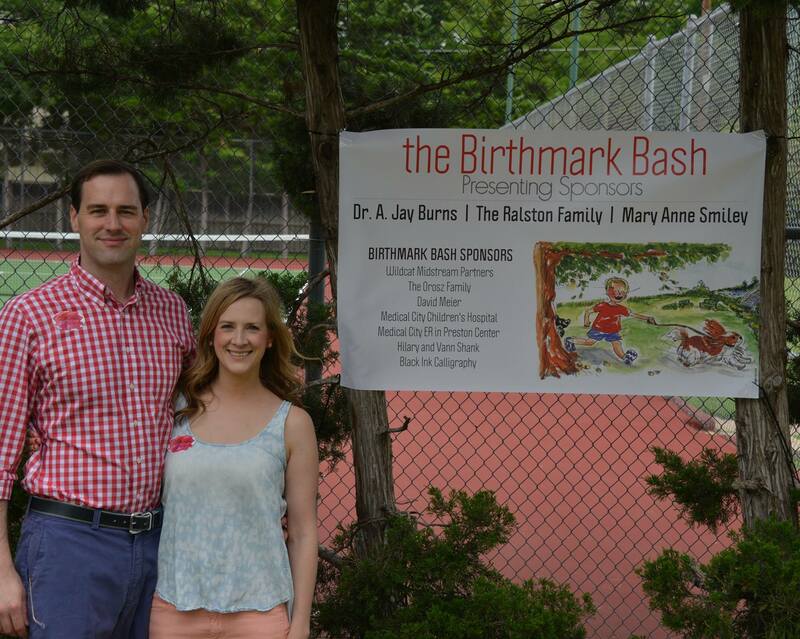 Dr. Levitin reads Buddy Booby Birthmark to his daughter Cora. Eric Pixley of PortWineProud shares adorable #POYB photo. 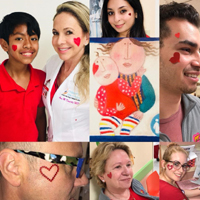 Dr. Duarte and her team inspire 200 hearts at the Children’s Skin Center at the Nicklaus Children’s Hospital. Laura and Devin Fischer hand out goodie bags and Read Buddy Booby’s Birthmark while hosting a classroom awareness event to honor their son Caleb. Biking for Alonso from London to Paris in 24 hours! 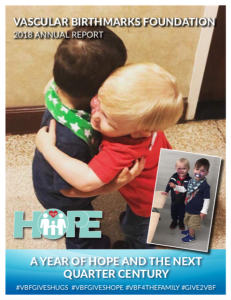 – The Maddox Family – Help Celebrate Carson’s 4th Birthday! also helped organize this annual event. VBF Executive Assistant Basia Joyce – VBF Walk/Run organizer. Basia’s daughter Anna had a hemangioma. Jenny is putting on a show in NY. Jenny has port wine stain. Walk/Run in NY. Lianne’s son Cody has a lymphatic malformation. lip and was the inspiration for the organization of VBF. 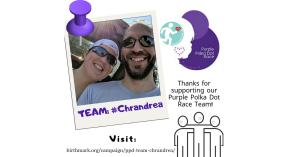 a team for the VBF Walk/Run. Saige was the inspiration for the bracelets. She designed them as a fundraiser for the first VBF Day of Awareness. bracelet for children. 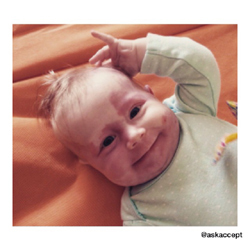 Saige had extensive facial hemangioma. Read Along to Owen Dreger’s Pre-school class. and their siblings/friends called “Glen’s Gang”.